Birding Is Fun! 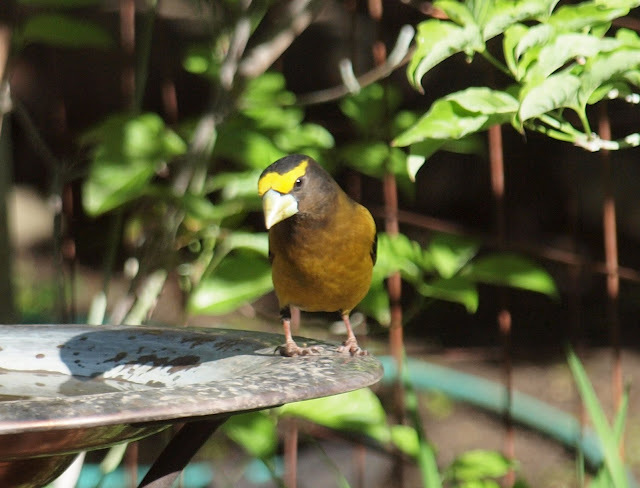 : Evening Grosbeak - love the Unibrow! 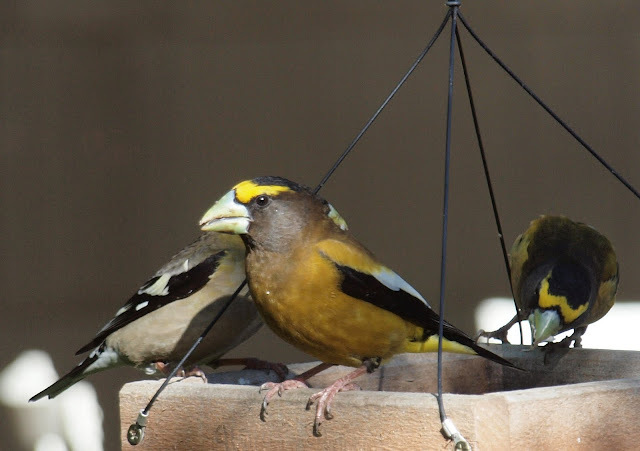 Old-timers in Idaho's Treasure Valley (the greater Boise area) recall with fondness the amount of Evening Grosbeaks that they used to get in their yards. For the last couple of decades Evening Grosbeaks have been few and far between in the valley. I personally had only seen them in the mountains around McCall, Idaho. 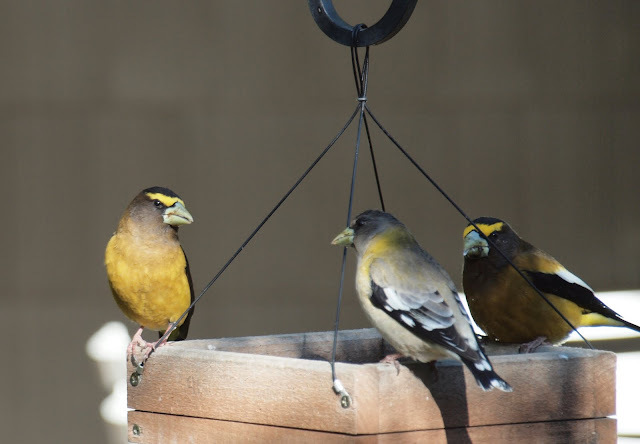 It has been heartening to hear that several folks in Boise, all in the very mature landscape areas, were having Evening Grosbeaks show up in force at their feeders. I visited the homes of a couple birders, and as luck would have it, I dipped at both locations, having just missed them by minutes. A couple days later I tried the Henderson home again while on the way to check a nearby remodel I am working on and was rewarded with lots of Evening Grosbeaks and close-up views as these photos attest. These mountain birds look like they could be tropical vagrants. These males really know how to sport an attractive unibrow! I enjoyed looking at these birds up close. The brown hue of the face; white, black, and yellow wings. The female is very distinct. If it wasn't for the striking males, we'd probably regard her more as the beauty that she is. Photo-tip Request: How would I prevent that cool yellow uni-brow from being over-exposed and still get quality detail on the rest of the bird? Thanks to Bob Whitlatch and Danette Henderson and both of your families for letting me invade your homes and yards for a couple of days to see these awesome birds in town. To good timing, good luck, and good friends. 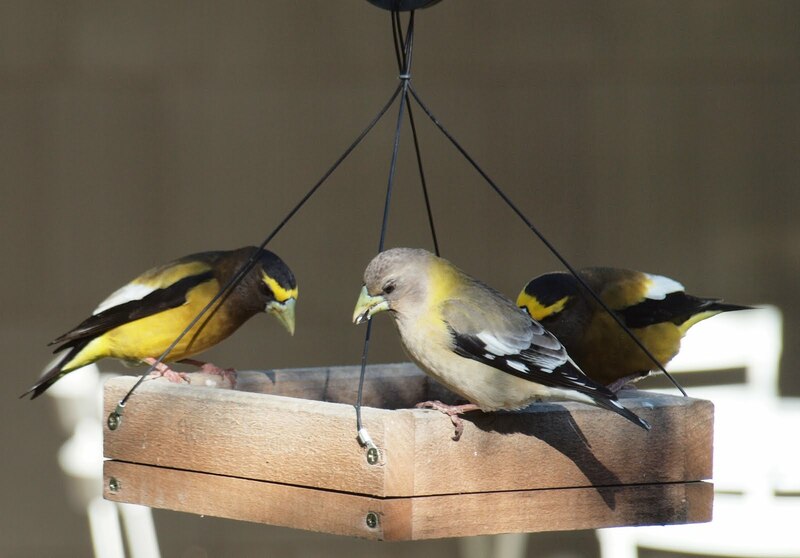 Such beautiful Evening Grosbeaks! WOW ~ They are Beautiful!! Beautiful birds! Great captures! I have never seen one before...thank you for sharing. 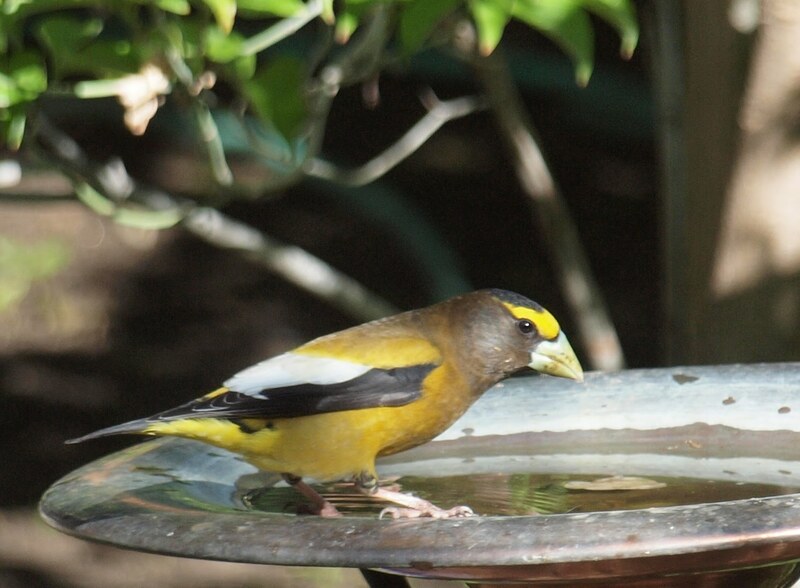 I used to have Evening Grosbeaks as regulars at our feeders near Seattle and have missed them. Cool photos. Regarding your exposure question, my take is that this is a good example at what a little "burning" can do in photoshop. The "unibrow" isn't really too overexposed but is pretty hot and reflecting a lot of light. This would be a good candidate to burn that unibrow slightly to even it out with the rest of the bird. You'll find the detail is still there because it's not completely overexposed. Note: There are some effective and not-so-effective photoshop techniques for burning. The burning/dodging tool in photoshop is actually less effective. Scott Kelby gives some great tips on how to burn effectively. Just my two cents. The Evening Grosbeaks are gorgeous birds and your photos are wonderful. I would trade you a Pine Warbler for Two Grosbeaks. Beautiful birds and it was great that you could get such good close photos. Lovely shots of these beautiful birds! I never got to see this species in my 5+ years of birding in the U.S.
Great shots of the Evening Grosbeaks Robert! I love seeing these birds in the summer here too. They add such brilliance to the landscape. A truly beautiful species and your photos are excellent! Hey Robert next time try using your flash, I know it sound wierd to use your flash in the light but it helps with shadows and it just might even out the coloring of the bird. I love these birds and you have captured their beauty with a wonderful photo series. Great work! I have yet to see one of these birds. Thanks for sharing. Nice captures! Super bird, super pictures. Nice to have in a garden. Hey Robert, I googled "Evening Grosbeak" and these photos showed up at the top of the list along with a link to this blogpost! How wonderful to see these birds. I have not seen them for years! I think the last time I saw them was when I lived in Maine and they were at my in-law's feeders but I will have to check that. Anyways, great post!